Soup season! Nothing warms you from the inside out like a hearty bowl of soup. You might be saying, “but, Kathleen, it’s CAULIFLOWER, EW! !” and I would reply, “Take a risk, it’s January, a time to try new things!” But seriously, even though I am a cauliflower lover, I’ve had cauliflower “naysayers” eat this soup AND they like it! The next few weeks I’ll be posting a couple of delicious, heart-warming soups. 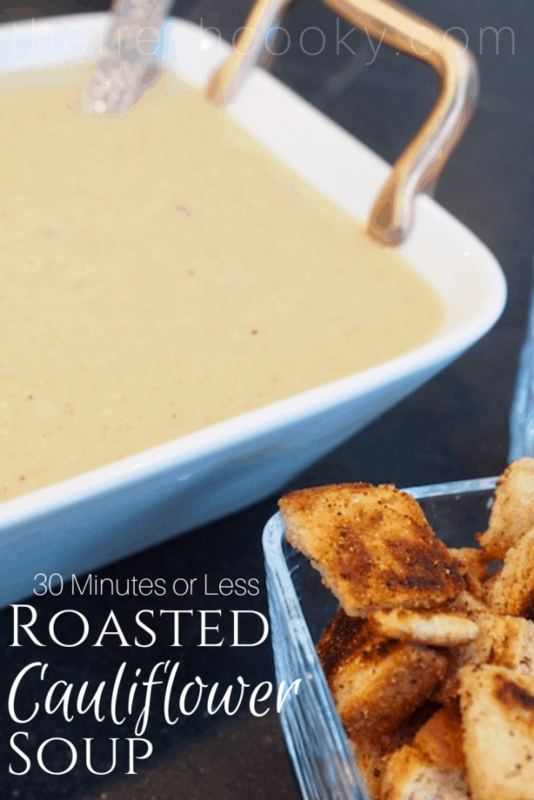 This is one of my favorites, a super simple and yet, oh-so-flavorful roasted cauliflower and garlic soup. I’ve been making this recipe for years; it’s a mash-up between two recipes, one from Rachel Ray and the other from Closet Cooking, I took the best of both of their recipes and came up with this recipe. The best part; it’s ready in under an HOUR! Are you a resolutions person? Goals? Lists? I’m not big on resolutions and the more I read, the more I realize I’m not alone. I’m more of a goals and lists girl; the older I get the simpler the goals are, like, “wake up, or put the laundry away within 24 days, uh, I mean hours, or tackle one cupboard/closet a week.” These are not lofty goals, but when you put them all together they really do add up. The older I get the more clutter makes me a bit crazy, which is funny because I’m the queen of creating clutter! My HSD (horizontal surface disorder-ha!) is in full effect right now; Christmas cards laying in piles waiting for me to organize, recipes ripped out from great magazines, an abundance of cookbooks with sticky notes on all of the recipes I want to try, mail that hasn’t been gone through, papers that need to be filed….I could go on and on, that’s just in my kitchen! My organized German side kicks into gear and the desire to see white space increases by the minute, to the point, where I put aside doing any other chore, just so I can have an un-cluttered counter. I breath a bit easier when things are tidy and in their proper place. Do you? 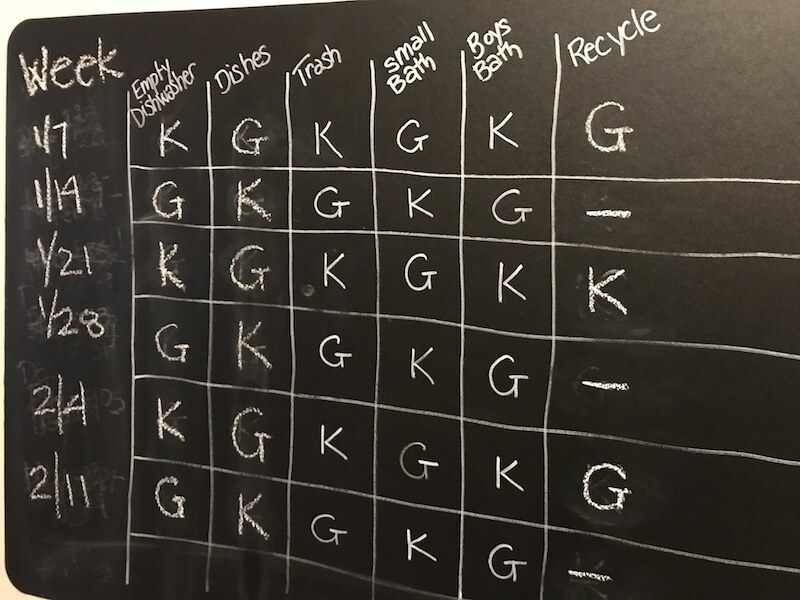 In fact, I shared our family chore chart on Instagram this week and had quite a few responses. It was born out of frustration, when our boys would fight over who did what chore, as some of our chores changed from week to week and there hasn’t been nary a fight since! I love watching them go to the board, find the week and discover that indeed mom was right when she asked said child to take out the recycle bins! NO arguments or yelling “it’s not fair!” It’s blissful, this isn’t a comprehensive list of their chores, just the rotating ones, the others they do regardless weekly. Enlist your kiddos early, it’s good for the whole family! This month I joined my friend Eliza’s January Money Diet and it’s been spot on for me each day! Simple tasks to do each day that will help you save money, reduce costs and for me, most importantly reduce clutter! Day one started with gathering 31 things you no longer needed or used and either give them away or sell them. Well, I’ve gathered about 3001 (sometimes I exaggerate) things that we no longer need; I’ve sold some, thrown some away, but mostly filled the back of our aging Suburban with items stuffed into garbage bags and boxes to take to ARC. I haven’t taken them yet, because each day my eye gravitates towards something additional that I can toss in the back of the car to give away. My goal is to go through two more cupboards before I take it all in. Let’s get our garlic roasting first, that is what takes the longest. Preheat your oven to 425°. 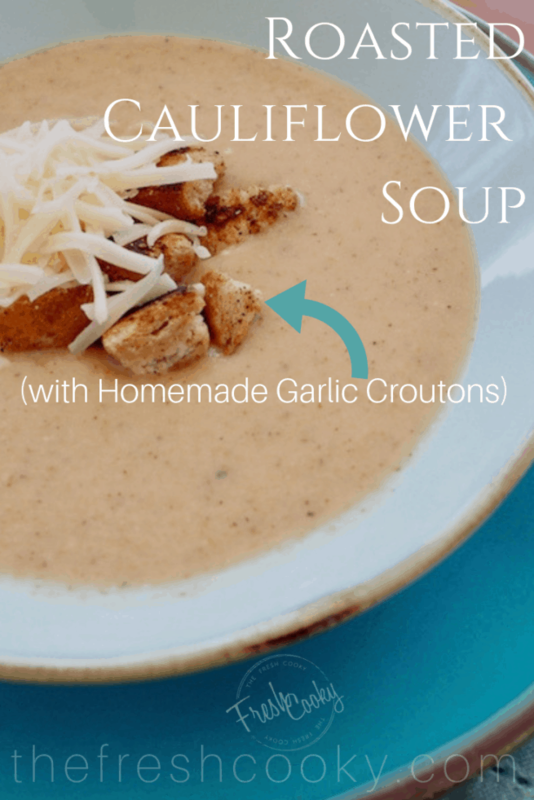 If you know you are going to make this soup, you can easily make the roasted garlic ahead of time so that it’s all ready when you start assembling your soup, for that matter you can roast your cauliflower ahead of time as well! Just refrigerate until ready to use. 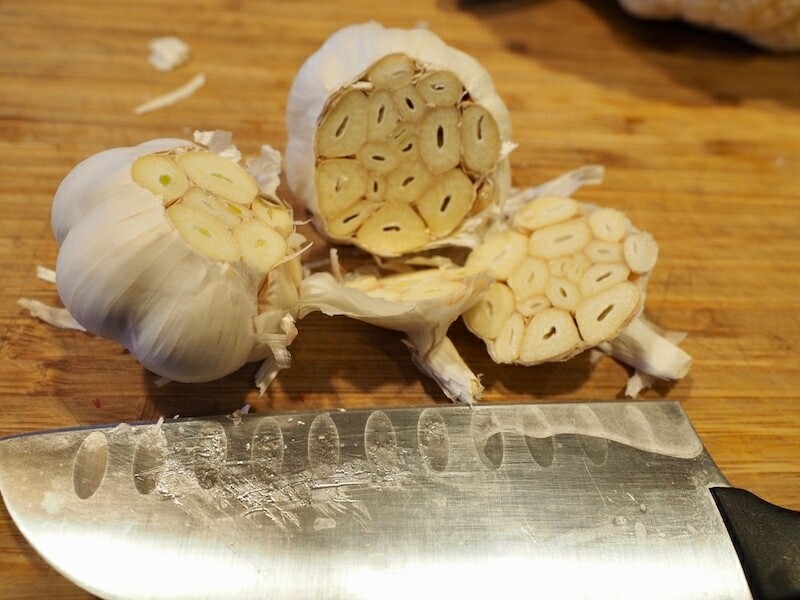 Start by lopping off the top 1/4 of the bulbs of garlic, just enough to expose each of the cloves. 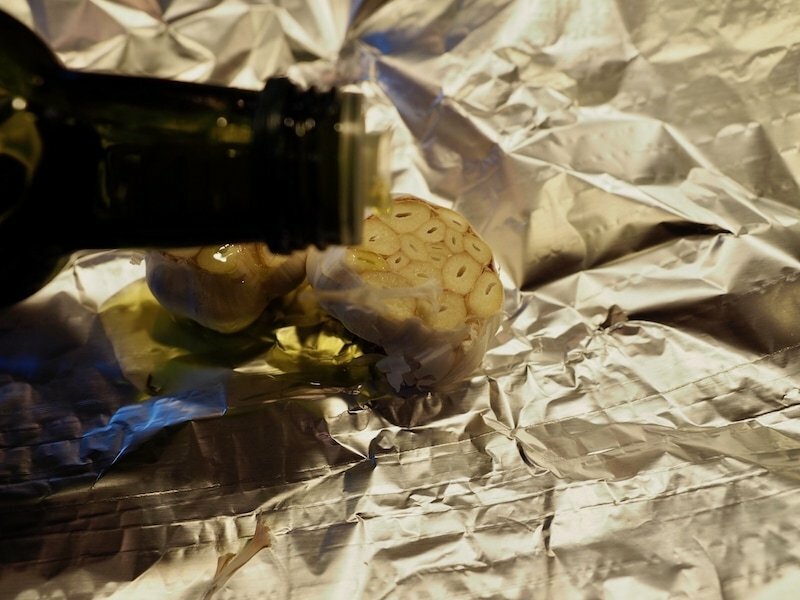 Set the cloves of garlic on a sheet of foil and drizzle a little olive oil over the tops and sprinkle with a little sea salt. Seal up foil and place in preheated oven roasting for 20-25 minutes. 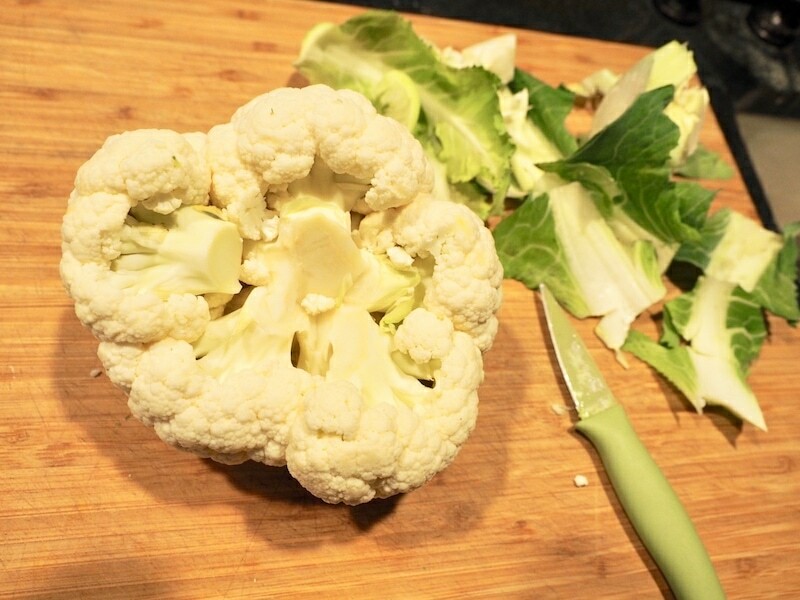 While your garlic is roasting, wash and segment your cauliflower into little florets, don’t be too worried about them being the same size as you will roast them and then they will be pureed later on. 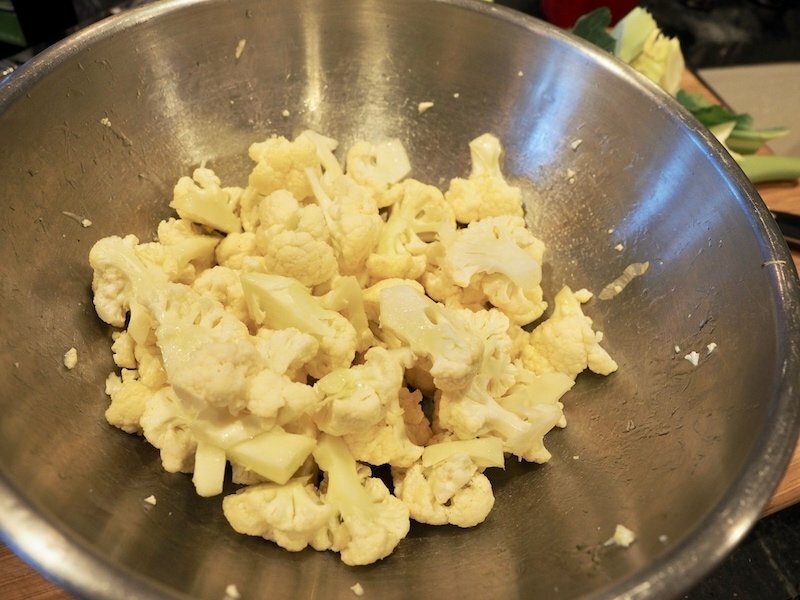 Place cauliflower florets into a large bowl and toss with 1 tablespoon olive oil and salt and pepper. Stir around to coat the cauliflower. 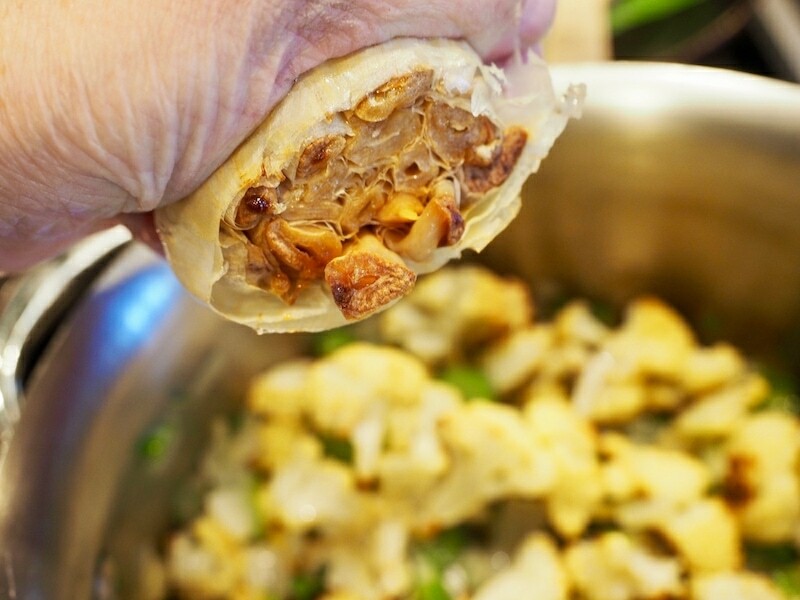 Place prepared cauliflower onto a sheet pan (lined with foil or parchment paper for easier cleanup) and roast along with garlic for 20-30 minutes, tossing half way through. Roast cauliflower until tender, golden brown and a little charred too. 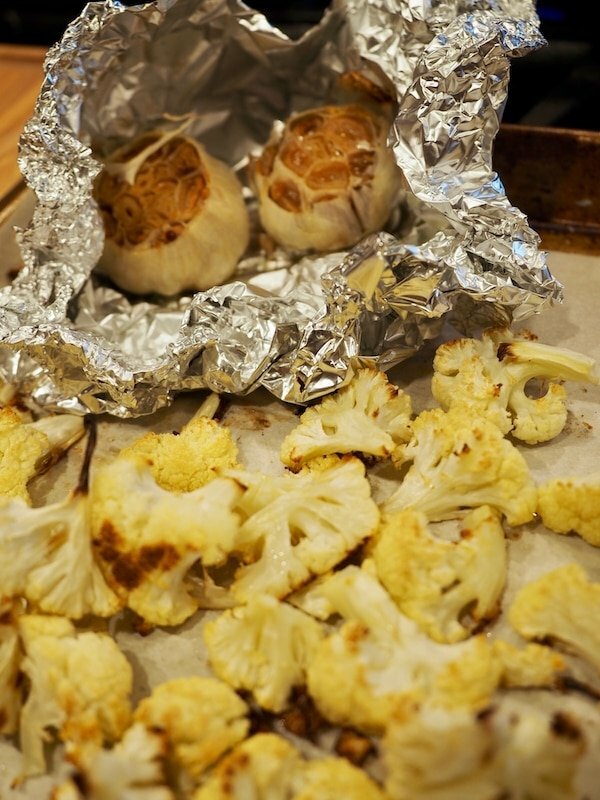 Continue roasting the garlic for the duration of your cauliflower roasting. …prep your veggies for sautéing. 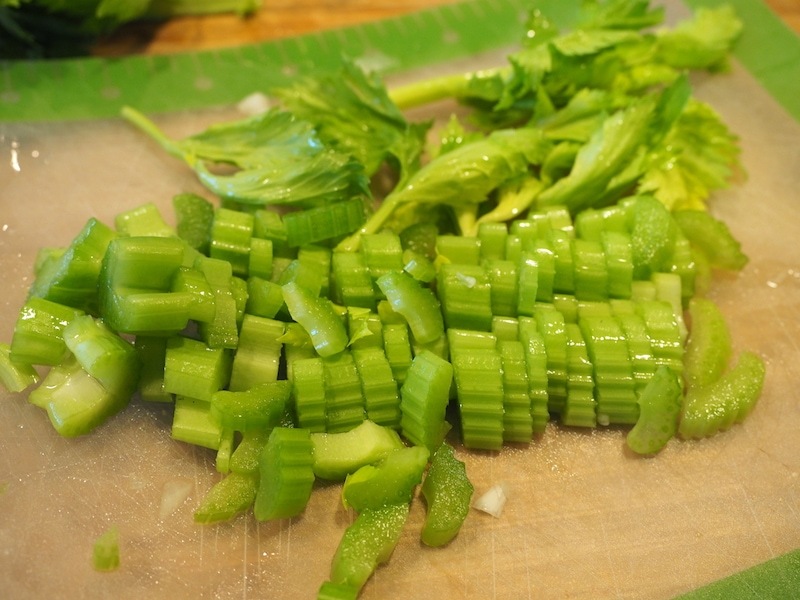 Chop your celery, including the leafy tops from the heart. 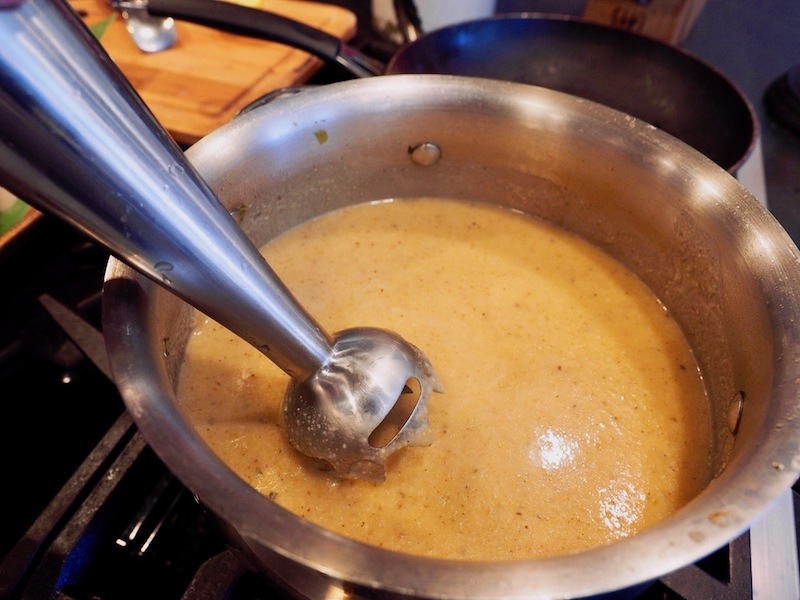 In a medium sized soup pot, over medium heat, melt 2 tablespoons of butter and 1 tablespoon olive oil. Sauté until fragrant and golden brown. 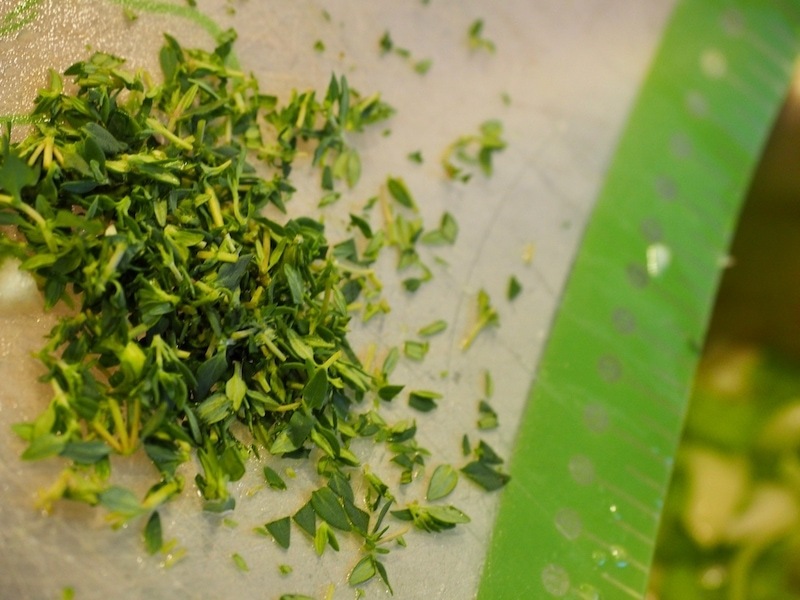 Chop and add your fresh thyme, which I happened to have on hand this time, but it’s perfectly fine to use dried thyme as well. 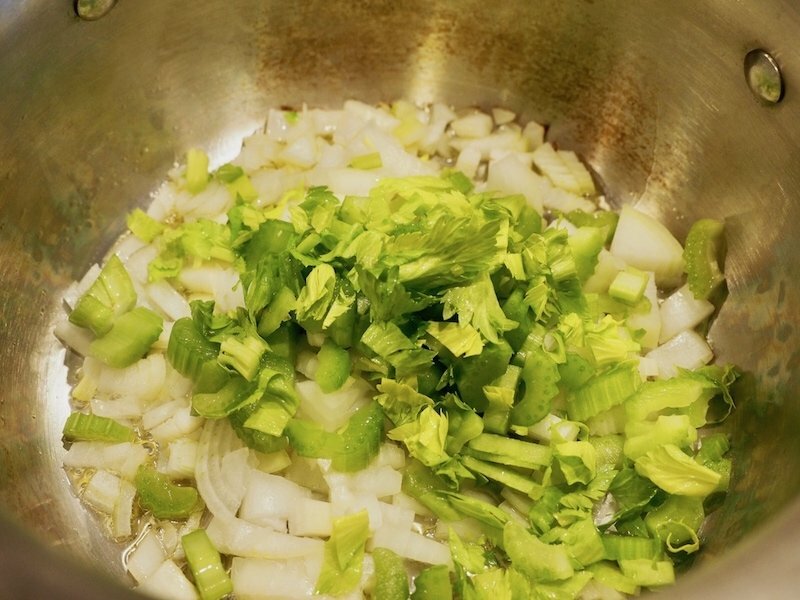 Sauté along with the onions and celery. 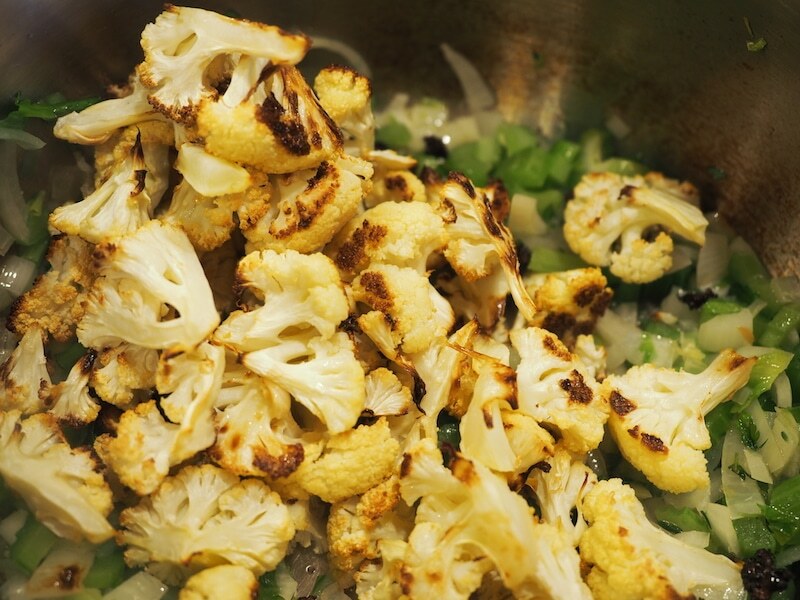 Remove your cauliflower from oven and toss into pot, sautéing for a few minutes. Squeeze in your garlic cloves (oddly satisfying); if the head is still too hot to touch, wrap a paper towel around the bulb and you should be able to squeeze the garlic cloves into the soup plop pot, making cute plopping noises as they go in! Give it all a good stir and increase your heat slightly; next we’ll add the chicken stock, pour in the whole quart and stir to get any of those yummy brown bits stuck on the bottom of the pan. 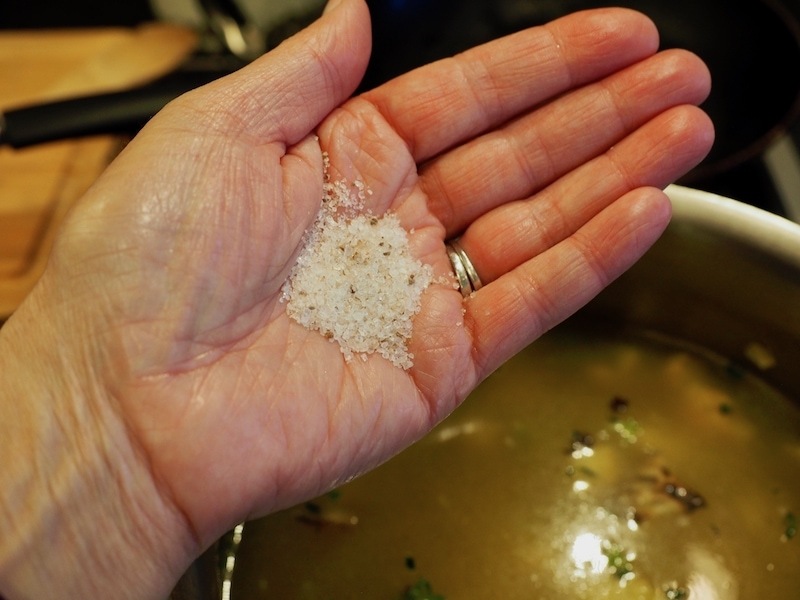 Toss in about a teaspoon of salt, you can adjust later and stir to combine. Bring to a simmer, cover and cook for 15 minutes until veggies are tender. Using a immersion or stick blender, blend until smooth or may be pureed in a blender by removing a couple cups at a time and process until smooth, careful it’s hot. A few chunks in the soup is just fine! Add your cream or milk (many times I’ll use half and half or use half cream, half whole milk). And bring to simmer, check seasoning, add a bit more salt and pepper if desired. Serve immediately or may be cooled and reheated if need be. 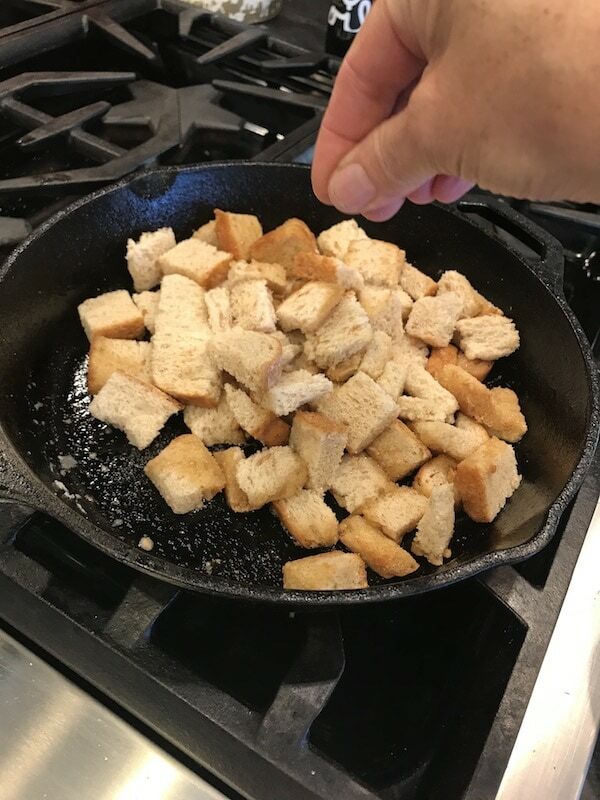 Ladle into bowls, topping with a small handful of shredded cheddar cheese and these simple garlic croutons. Melt 1/4 cup of butter (1/2 a stick) in a hot pan over medium-high heat. 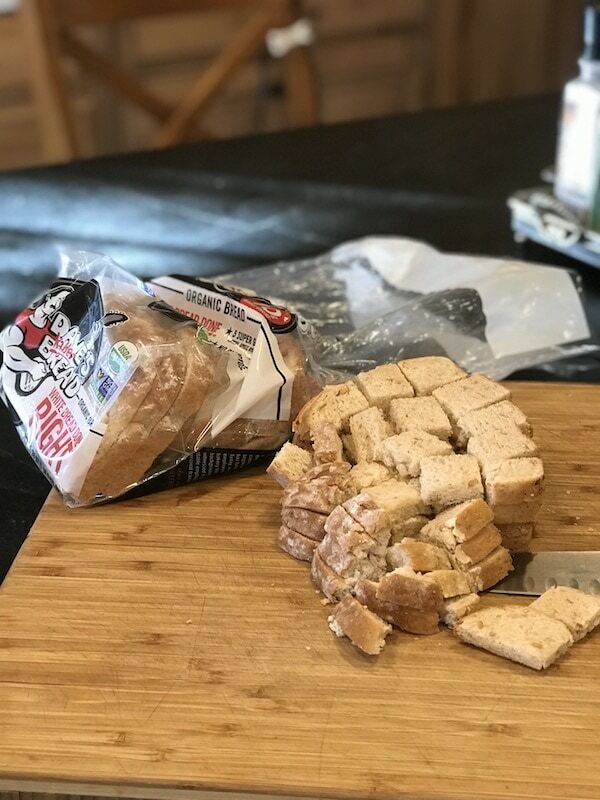 Take 4 slices of your bread of choice, and slice into cubes of desired size. Seriously, I just use what I have on hand, if you want to get really fancy, you can cube french or sourdough bread, but honestly I generally use plain ol’ sandwich bread. You can also do this using gluten free breads! 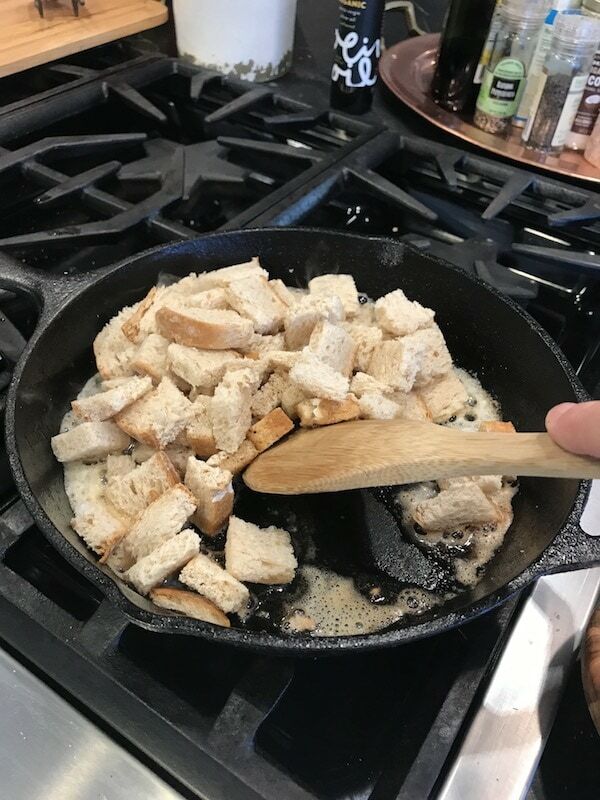 Toss your bread cubes into the hot butter and toss around quickly, distributing the butter to as many surface areas of the cubes as possible. Sometimes I need to add a bit more butter, depending on how they toast. 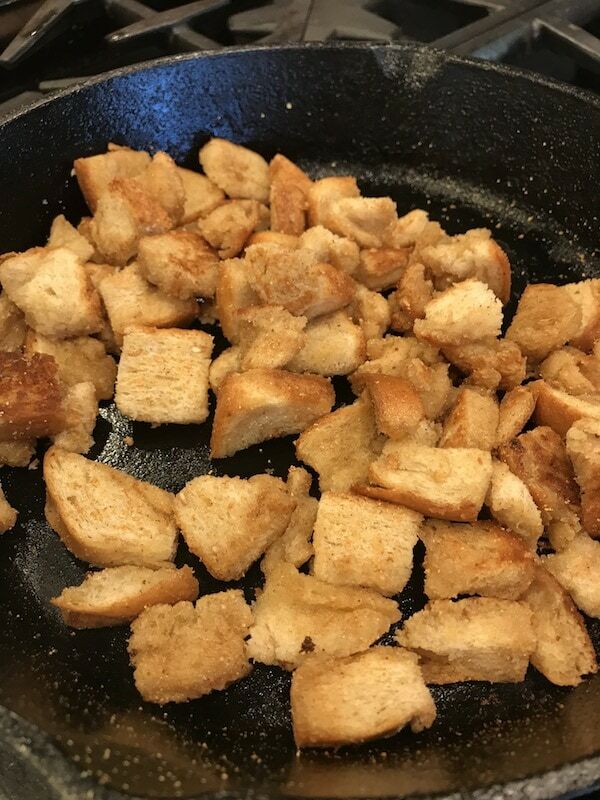 Continue gently stirring or tossing the cubes around to heat and toast as evenly as possible. 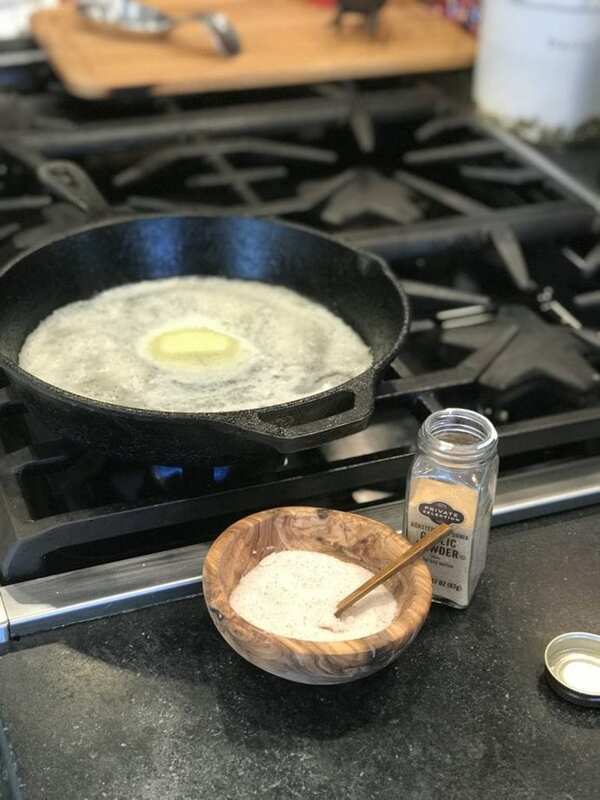 Once they are toasted, about 4-5 minutes, less or longer depending on how crisp you like them, try one and make sure they are seasoned to your liking, adjust seasonings if need be and then remove from pan onto paper towels to cool and dry. 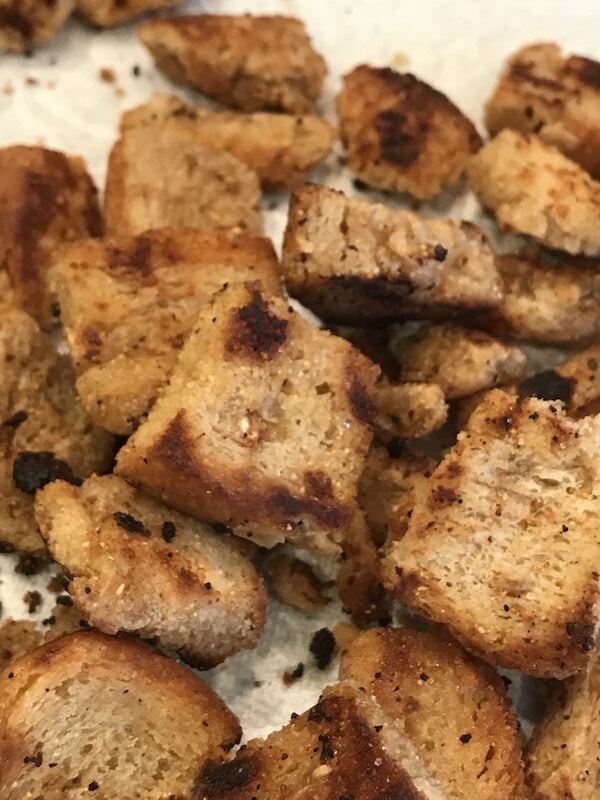 These aren’t your traditional crouton, they are softer than normal. If you are patient, they can sit on the counter for a bit to “crisp” up a bit more, but they don’t last long on my counter; everyone walks by and steals a handful here and there. Serve on top of your soup with a generous pile of shredded sharp cheddar cheese and if desired a sprinkle of parmesan cheese as well. I hope even if you are a cauliflower hater disliker, that you will give this soup a try. I’ve made it for luncheons with a large salad like my Sweet Maple Apple Pecan Salad and a loaf of crusty bread; it’s also wonderful as a lighter dinner with just the soup, some sliced veggies and a dinner roll (try my Oatmeal Dinner Rolls from last weeks post) or this Beer Bread goes great with it as well. 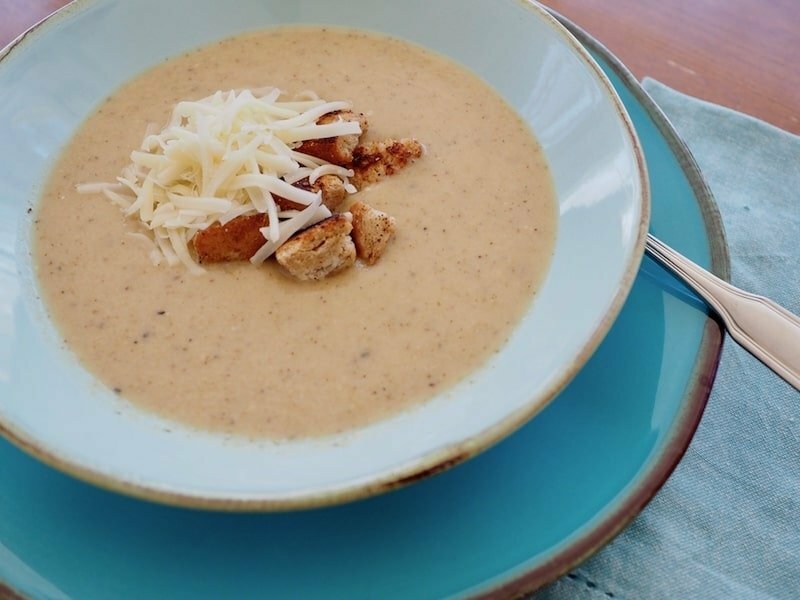 A deliciously deceptive soup, filled with healthy roasted cauliflower and the creaminess of roasted garlic, finished with sharp cheddar cheese and simple homemade garlic croutons it’ll warm you from the inside out. Cut 1/4 top off of garlic heads, drizzle a little olive oil over the tops and sprinkle with a little sea salt. Wrap in foil and place in preheated oven, roast for 40-60 minutes until soft and brown. Meanwhile, wash and cut up cauliflower head into florets. Place in a bowl and drizzle with 1-2 tablespoons olive oil and sprinkle with salt and pepper. Lay in single layer on a sheet pan (lined with parchment or foil for easy cleanup). Roast in oven (with garlic) for 20-30 minutes until golden brown, soft and lightly charred. 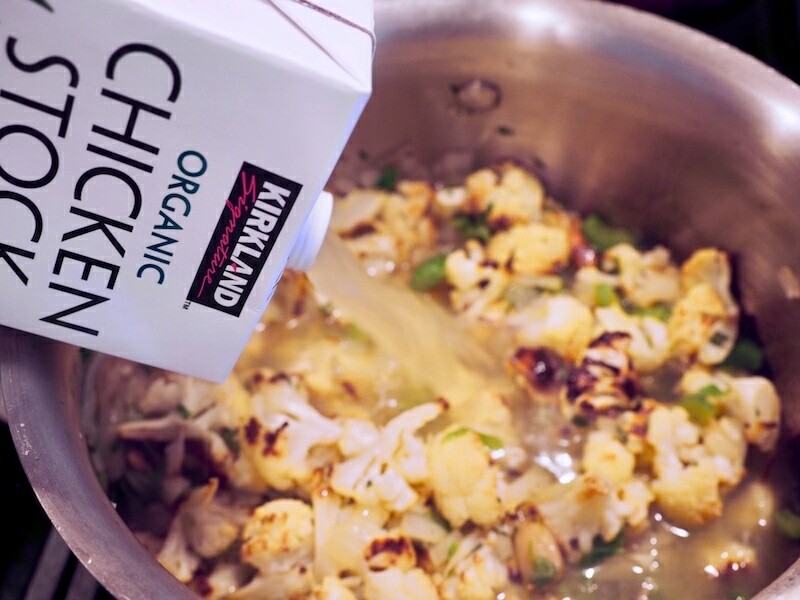 While roasting the cauliflower and garlic, melt your butter and oil over medium heat in a medium sized soup pot. Place your diced onion, celery into medium sized pot with melted butter and oil and saute until golden and soft, add thyme and stir around. Once the cauliflower is roasted, add to pot with onions and celery, stir around. Squeeze the soft cloves of roasted garlic into the soup pot (if too hot, wrap garlic bulb in paper towel and squeeze from bottom up popping out the soft cloves of garlic). Increase the heat slightly and add chicken stock. Bring to simmer, reduce heat and cover and simmer for 10 minutes until all veggies are soft and flavors blend. Using an immersion blender or regular blender, blend until desired smoothness (some chunks are fine, or completely smooth is fine too). Add milk (or half and half or alternative) and stir to combine, heat through. Serve immediately or cool and reheat to serve. 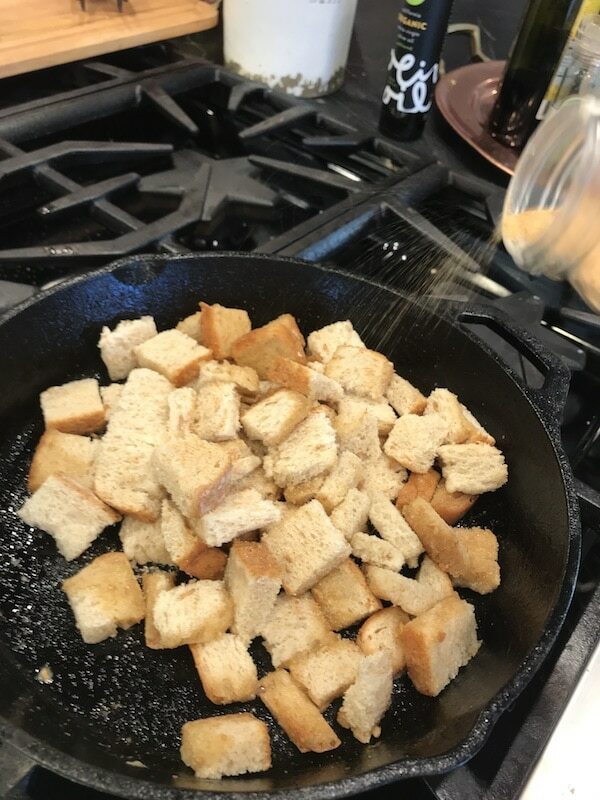 Garnish with Garlic Croutons and a handful of shredded sharp cheddar cheese and if desired a little bit of grated parmesan cheese. Heat a large pan on medium-high heat and melt 1/4 cup butter. Cube 4 slices of bread of choice and toss into hot butter, shaking and stirring well to distribute the butter evenly. Sprinkle with salt and garlic powder, keep toasting 3-5 minutes until desired doneness. Turn out onto paper towels to cool. 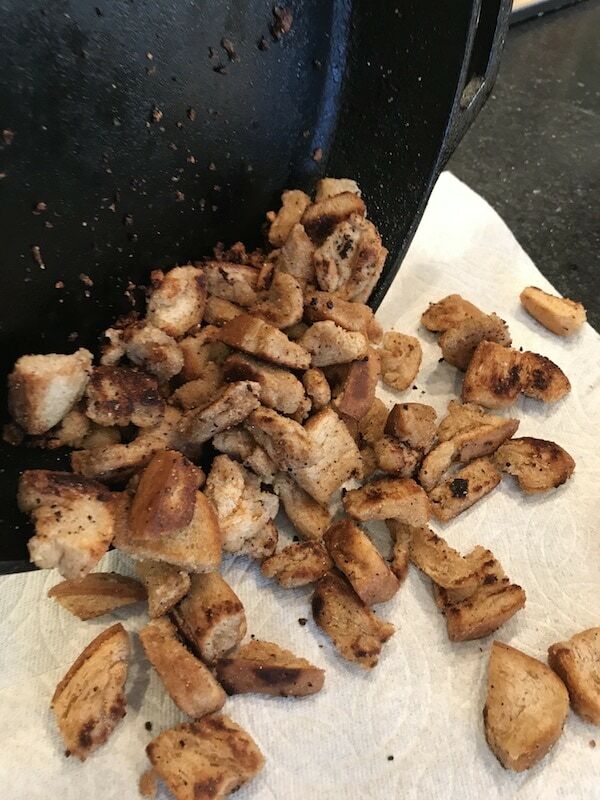 They will be softer than a normal crouton, you can make these ahead and leave on the counter and they will dry out and crisp up as they sit out. But they are just as delicious soft! 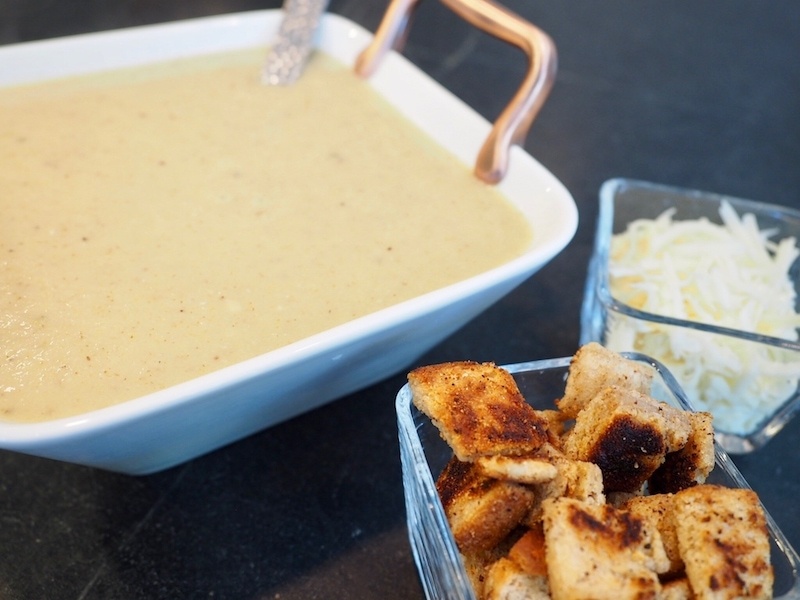 Copyright 2018 | This recipe for Roasted Cauliflower Soup with Garlic Croutons was featured first onThe Fresh Cooky. Kathleen, I’ve never tried cauliflower soup, I’m putting this on my list of soups to try. This looks delicious! I do hope you try it and love ❤️ it! !